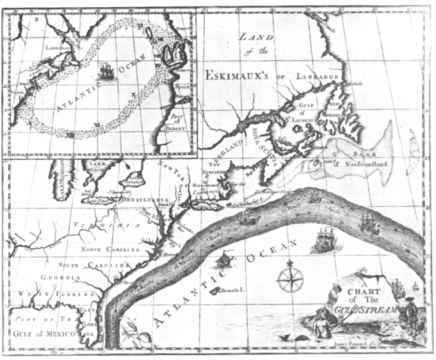 European exploration of the eastern seaboard of the New World began in earnest during the sixteenth century. Coastal lands were investigated and much effort was put into the search for a North-West Passage through to the Pacific. The earliest surviving reference to the Gulf Stream was made by the Spaniard Ponce de Leon in 151His three ships sailed from Puerto Rico, crossed the Gull Stream with great difficulty north of what is now Cape Canaveral I in Florida), and then turned south. By I ? 19 the Gulf Stream was well known to the ships' masters who sailed between Spain and America. On the outgoing voyage, they sailed with the Trade Winds in the North Equatorial Current: on their return, they passed through the Straits of Florida and followed the Gulf Stream up about as far as the latitude of Cape Hatteras t~35'"J N}. and then sailed for Spain with the prevailing westerlies (Figure 2.3). As early as 1,515* there were well considered theories about the origin of the Gulf Stream. Peter Martyr of Angheira used the necessity for conservation of mass to argue that the Gulf Stream must result from the deflection of the North Equatorial Current hy the American mainland. Explorers had not found any passage which would allow the North Equatorial Current to 11 ow through to the Pacific and thence back around to the Atlantic; the only other possibility was that water piled up continuously against the Brazilian coast, and this had not been observed to happen. The North Equatorial Current itself was thought to result in some way from the general westward movement across the heavens of the celestial bodies, which drew the air and waters of the equatorial regions along w ith them. During the 1600s. the eastern coast of North America was colonized by Europeans and the Gulf Stream was traversed countless times and at various locations. In the following century the experience gained in the great whaling expeditions added further to the knowledge of currents, winds and bottom topography. This accumulating knowledge was not. however, readily accessible in technical journals, but handed down by word of mouth. Charts indicating currents did exist - the first one to show the 'Gulf Stream' was published in 1665 - but they were of varying quality and showed features that owed more to the imagination than observation. The first authoritative chart of the Gulf Stream was made by William Gerard De Brahm. an immensely productive scientist and surveyor who. in 1764, was appointed His Majesty's Surveyor-General of the new colony of Florida. De Brahm's chart of the Gulf Stream (Figure 4.1 (a)) and his reasoned speculation about its origin were published in The Atlantic Pilot in 1772. At about the same time, a chart of the Gulf Stream was engraved and printed by the General Post Office, on the instructions of the Postmaster-General of the Colonies. Benjamin Franklin. This chart was produced for the benefit of the masters of the packet ships which carried mail between London and New England. A Nantucket sea captain. Timothy Folger. had drawn Franklin's attention to the Gulf Stream as one cause of delay of the packet ships, and had plotted the course of the Stream for him (Figure 4.1(b)). The theories of oceanic circulation that had evolved during the seventeenth century were seldom as well constructed as the charts they sought to explain. During the eighteenth century, understanding of fluid dynamics advanced greatly. Moreover, the intellectual climate of the times encouraged scientific advances based on observations, rather than fanciful theories based in the imagination. Franklin, who had observed the effect of wind on shallow bodies of water, believed that the Trade Winds caused water to pile up against the South American coast: the head of pressure so caused resulted in a strong current flowing 'downhill' through the Caribbean islands, into the Gulf of Mexico, and out through the Straits of Florida. Franklin made a series of surface temperature measurements across the Atlantic and also attempted to measure subsurface temperatures; he collected water for measurement from a depth of about 100 feet using a bottle, and later a cask, with valves at each end - a piece of equipment not unlike the modern Nansen bottle. Figure 4.1 (a) De Brahm's chart of Florida and the Gulf Stream. On this projection, lines of latitude (not shown) are parallel to the top and bottom of the map, and the curved lines are lines of longitude. 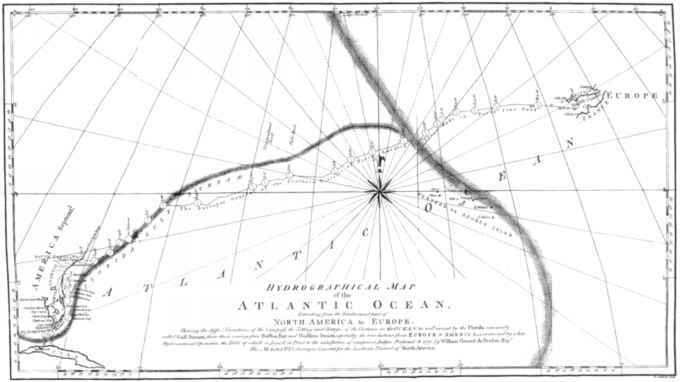 In the small circles along the path of the Gulf Stream are Indicated the bearings of the current read against magnetic north, (b) The chart of the Gulf Stream and North Atlantic gyre (inset), made by Timothy Folger and Benjamin Franklin. documented the variability found in the Gulf Stream. He distinguished between 'drift currents', produced by direct stress of the wind, and 'stream currents' produced by a horizontal pressure gradient in the direction of the flow (the term 'drift current' is still used occasionally). Rennell agreed with Franklin that the Gulf Stream was a 'stream current". The current charts shown in Figure 4.1 were produced mainly from measurements of ships' drift. By the time of Franklin and De Brahm, accurate chronometers had become available and ships' positions could be fixed with respect to longitude as well as latitude. Position fixes were made every 24 hours; between fixes, a continuous record of position was kept by means of dead-reckoning, i.e. the ship's track was deduced from the distance travelled from a known (or estimated) position and the course steered using a compass. The accumulated discrepancy after 24 hours between the dead-reckoning position and the accurately fixed position gave an indication of the average 'drift' of the surface water through which the vessel had passed (Figure 4.2). However, sailing vessels were themselves strongly influenced by the wind, and there could be considerable difficulties in maintaining course and speed in heavy seas. These inherent inaccuracies, combined with any inaccuracies in position-fixing, meant that estimates of current speeds so obtained could be very unreliable. Although single estimates of current speed obtained from ship's drift were unreliable, accumulations of large numbers of measurements, as compiled by Rennell, could be used to construct reasonably accurate charts of current flow, averaged over time and area. Collection of such data from commercial shipping has continued to the present day and this information has been used to construct maps of mean current flow (e.g. 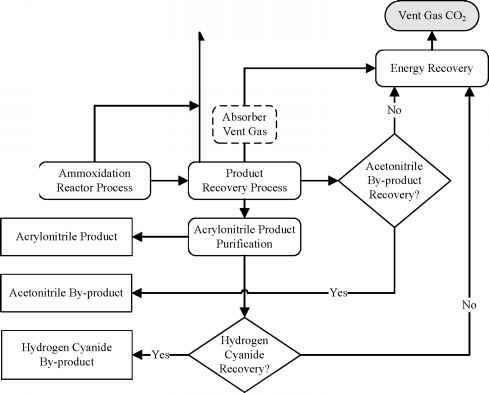 Figure 5.12). Current speeds estimated by dead-reckoning are now considerably more accurate, thanks to position-fixing by radar and navigational satellites, and the use of automatic pilots. Figure 4.3 Maury's chart of the Gulf Stream and North Atlantic Drift (now usually referred to as the North Atlantic Current). Note also the temperature traverses of the Gulf Stream at different latitudes, shown at bottom left. and oceanic conditions (including sea-surface temperature, specific gravity and temperature at depth) should be made at intervals of two hours. This was soon increased to four hours, but apart from that the system has remained largely unchanged up to the present time. Maury's contribution to practical navigation can be immediately appreciated by looking at his chart of the Gulf Stream and North Atlantic Drift (Figure 4.3). He was not, however, a great theoretician. He rejected the theory that the Gulf Stream owes its origin to the wind on the basis of the following argument. The Gulf Stream is wider at Cape Hatteras than in the Straits of Florida; so. given that its total volume transport stays the same and that the flow extends to the bottom, the sea-bed must be shallower at Cape Hatteras. The Gulf Stream therefore has to flow uphill and must be maintained by some mechanism other than wind stress. (a) By reference to die idea about Gulf Stream generation shared by Franklin and kennel 1. explain briefly why Maury's argument is seriously flawed. About whai basic principle was he confused? ilu In fact. Maury was not justified in assuming that the volume of water transported in the Gulf Stream is the same at Cape Hatteras as it is in the Straits of Florida By reference to Figure 3.1. can you explain why? 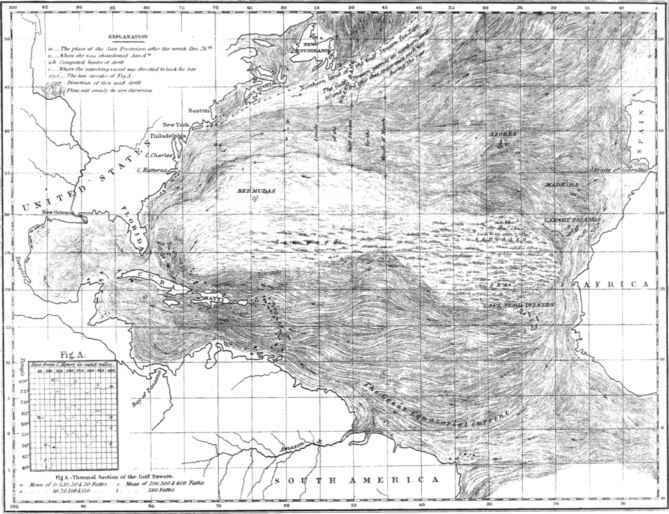 Modern hydrographie surveying of the Gulf Stream can be said to have begun in 1844 with the work of the United States Coast and Gcodetic Survey, under ihe direction of Franklin's great-grandson. Alexander Dallas Rache Since that time there have been a number of surveys of both current velocity and temperature distribution. Perhaps the most impressive work was done by John Elliott Pillsbury who made observations along ihe Gulf Stream a( a number of locations, including several in the Straits of Florida. He measured the temperature al a number of depths and also recorded the direction and speed of the current using a current meter of his own design These observations made in the 1890s were not repealed until relatively recently and have been i n valu ah le to oceanographers in the twentieth; century (as you will see in Section 4.3.2). Like most seagoing men of his time. Pillsbury was convinced that ocean currents were generated by (lie wind. There were, however, severe difficulties in explaining the mechanism whereby the wind could drive the ocean. Advances in understanding were held tip tor two main reasons. The first of these was that the significance of the turbulent nature of flow in the oceans was not fully appreciated. QUESTION 4.2 One objection to the idea of wind-driven currents (put forward by a contemporary mathematical physicist) was that the wind would need to blow over the sea-surface for hundreds ol thousands of years before a current like the Gulf Stream could be generated. From your reading of Chapter 3. can you suggest why ibis objection would have seemed reasonable at the lime, and why we now know otherwise? The other great difficulty hindering progress was that the effect on ocean currents of the rotation of the Fan h was not properly understood, w iih the result that the roie of the Coriolis force in balancing horizontal pressure gradients in the oceans was overlooked. One of the first scientists to understand the effect of the Coriolis force on ocean currents was William Ferrel. Fend derived the relationship between atmospheric pressure gradient and wind speed, i.e. the equation for geostrophic llow in Ihe atmosphere- Unfortunately, oceanographers were not aware of Ferre l's work and so it w as not immediately applied to the oceans. The formula for computing ocean current speeds from the slopes of i sob uric surfaces - in other words, the gradient equation (3.11 ) - was derived by Henrik Mohn in 1885. a few years later. It was not until the first decade of the twentieth century lhat Sandsirom and Helliind-Harisen seriously investigated ihe possibility of using the density distribution in the oceans to deduce current velocities (cf. Section 3.3.3).